Steamer Lane-The Point in Santa Cruz is an exposed reef break that has very consistent surf and works all around the year. The best wind direction is from the northeast with some shelter here from northwest winds. Clean groundswells prevail and the best swell direction is from the southwest. A reef breaks right. Best around mid tide when the tide is rising. When the surf is up, crowds are likely Take care of rocks in the line up. 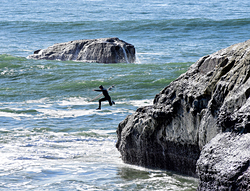 Voor Santa Cruz, California, 2 km van Steamer Lane-The Point. At Santa Cruz, 2 km from Steamer Lane-The Point. At Cabrillo Point, Monterey Bay, CA, 23 miles from Steamer Lane-The Point. The two graphs above are also combined in the single Steamer Lane-The Point surf consistency graph. Also see Steamer Lane-The Point surf quality by season and Steamer Lane-The Point surf quality by month. 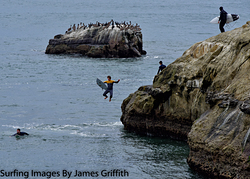 Compare Steamer Lane-The Point with another surf break. Gebruik deze reliëfkaart om naar de surfspots en de getijdenstations van CAL - Santa Cruz toe te gaan, in de buurt van Steamer Lane-The Point. The closest passenger airport to Steamer Lane-The Point is Norman Y Mineta San Jose International Airport (SJC) in USA, 47 km (29 miles) away (directly). The second nearest airport to Steamer Lane-The Point is Moffett Federal Afld (Mountain View) Airport (NUQ), also in USA, 52 km (32 miles) away. Modesto City Co Harry Sham Airport (MOD), also in USA is the fifth nearest airport to Steamer Lane-The Point and is 121 km (75 miles) away. 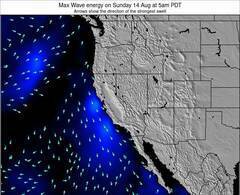 Dit is de Surf-Forecast-pagina voor Steamer Lane-The Point, CAL - Santa Cruz. Gebruik de tabbladen hierboven om de zeewatertemperatuur bij Steamer Lane-The Point te bekijken, foto's van Steamer Lane-The Point, Steamer Lane-The Point gedetailleerde golfvoorspellingen, wind- en weersvoorspellingen, Steamer Lane-The Point webcams, actuele wind in CAL - Santa Cruz live weerstations en Steamer Lane-The Point getijdenvoorspellingen. De link van United States golfkaarten opent een grote afbeelding van United States en de omliggende zeeën. Deze golfkaarten kunnen worden dynamisch gemaakt worden met de verschillende golfcomponenten, golfenergie, golfperiode, golfhoogte, samen met de wind en weersvoorspellingen, het actuele weer en de zeetoestand volgens golfboeien uit United States, langskomende schepen en weerstations op de kust. Elk voorspelling pagina's voor dit surfstrand zijn voorzien van een wereldwijde en regionale golfzoeker om de beste surfsomstandigheden in het gebied rond Steamer Lane-The Point te vinden.